The other week, the NZ Herald printed a good article on seven secret cycleways in Auckland. We covered it in last week’s Sunday reading post, but I thought it was worth adding a few more words on the topic. Waikaraka, Mangere Bridge, and Penrose. While the rides themselves sounded pretty good, it’s ironic to see that Elisabeth had to drive to the start of many of the cycleways. This illustrates a tricky problem: individual cycle projects are increasingly excellent, but connectivity into the local streets is usually lacking. This makes it hard to use them to get around, as it doesn’t feel safe to get off the cycleway, back onto the surrounding streets, and out to final destinations. This path offers some advantages for people seeking to travel places on bikes. First of all, it’s entirely off-road and runs through a big green belt, which means that it’s safe from traffic and not choked with fumes. Its northern branch terminates at the shops in Highland Park, and it has tendrils out to surrounding residential communities – meaning that there are both origins and destinations within reach. For context, here’s the legend on the map, which shows that most of the streets that are colored in are not in fact very useful for people on bikes. Light blue means that streets theoretically have “space” for cyclists but no dedicated cycle lanes. Yellow means that there’s a bit less traffic on the road. Roads coloured white are probably totally inhospitable if you’re travelling by bike. What this means in practice is that it’s difficult to get to many key destinations on bikes, even though there’s a cycleway running through the centre of Howick. There’s no connection to the Botany town centre, near the south of the map, or any facilities along the busy Pakuranga highway or connecting to the Panmure rail station. Again, this is problematic. While there are some on-street cycle lanes in the area, they don’t go anywhere near the Waikaraka cycleway. They lack physical barriers or safe hit posts to keep traffic out. As a result, it is quite difficult for people on bikes to safely travel to destinations like the Mangere town centre or Otahuhu rail station. This is not great either. There are no cycle facilities for people who want to get directly to the Onehunga town centre or rail station, let alone to head further north on Manukau Road. And there are a number of gaps on the route to Sylvia Park. I know that not everyone wants to cycle to the mall to shop, but I’m sure that there are a lot of teenagers (or adults, for that matter) who would love the option to bike there to hang out with friends or go to the cinema. What this shows is that there are many, many gaps in our cycle networks. We need to fill them to reap the benefits from a complete cycle network. It’s not like we lack the road space to do this – the light blue lines on AT’s maps show streets with enough space to add cycle lanes. But unless we get serious about joining up the network, we’ll be left with a bunch of well-designed cycleways that aren’t useful for many trips. What cycle infrastructure is your neighbourhood missing? A lot of our arterials could have a 3m two way cycle path and 0.8m to 1m physical protection be it by planters with high hedging or whatever. High chance could be our biggest transport mode if all built to this standard with safe separation from traffic. CAA must be angry when they see Copenhagen figures, I know I am then you get jobs like St Luke’s and no seperated dedicated cycle path at all? Transport Industry negligent nothing less, OK Government policies don’t help but they get their advice from transport professionals. Is having all ages ability to bike, or mobility scooter, or electric assist a good goal or not. 41% proven mode share in am peak is quite a dent and they don’t have harbours,beaches like we do. Peter, you just hit the nail very firmly on the head. And if you look at many of the streets in those areas on Google Maps or the Auckland Council GIS viewer with the aerials on, you will find an extraordinary amount of space that could be made available for separated, protected cycle lanes.. but that is currently given away for free storage of personal property. Yet in many streets little used. So the cities goal is liveable. What is the Level of Service for Walking and Cycling and Public Transport, shouldn’t these be an A even at expense of other mode! Len if you want a Liveable City tell them to change Level of Service A for active modes and public transport. They now what that means, they can work it out from there probably surprisingly fast. When we answer question 2a of ltp 2015, we need to not choose a or b, we all need to answer “complete the cycle network and the congestion free network”. Isn’t this simply a problem that any system takes time to complete? That budgets are necessarily incremental? That selection of priorities has to consider many factors? It’ll get done, but like everything else, not all at once. Why are we investing in more car network, car already has had all our spending,width and focus last 60 years. Just saying 1.4b for waterview could have given an entire seperated cycle network probably. Does Waterview have proven potential to take 41% of transport of the entire city. Yes or No? Now I’m looking at those Waterview/ Western Ring aerials, then I’m imagining a whole city being able to ride safely to school or work or to the beaches or with a carrier even shopping. Now Civils read those IPENZ Engineering Ethics again and think what would have delivered all those things vs that!!!!!!!! So not only lacking in capacity vs a citywide mode share, doesn’t deliver on any engineering ethics…..interesting be proud Waterview nice tunnel machine though!!! Hey stevenz, it’s true, it is a matter of priorities…except cycle lanes can be installed and trialled very inexpensively and quickly, as evidenced by the relatively quick transformation in NYC undertaken by Janette Sadik-Khan as transport commissioner. https://www.ted.com/talks/janette_sadik_khan_new_york_s_streets_not_so_mean_any_more . Plus, if you lay out cycle paths now, and make sure they’re connected and effective, you are taking cars off the road by allowing people to feel safer on bikes. Then maybe they can get a better idea of what motorway needs another lane. Thanks Peter. I think our vision is not nearly bold enough. If we are prepared to give up parking on arterials we could very quickly, and for less than the cost of one motorway interchange, build a complete network in Auckland- every arterial, not just the ones in CAA’s plans. AT could have a very simple code of practice: it’s either got separated cycle lanes or it’s 30km/hr. I currently have a new staff member who lives in Mangere Bridge. He doesn’t have a car so it’s an hour on the bus to our office in Newton. He would like to bike to Onehunga train station and then again from Newmarket up Khyber Pass to our office. The lack of safe infrastructure precludes this entirely reasonable trip, and it’s a good example of the problems with a piecemeal approach- for him it’s no good fixing the Onehunga end unless the Newmarket end is also done. It’s a timely week to talk about this, with road deaths showing impressive growth and commuters stuck for hours on the motorway due to crashes. We could do cycleways across the whole city with bollards in a few months- if we had leaders with vision. +1. It’s not rocket science. Separated or protected lanes on arterials, 30km/h on side streets. Start with a 500m radius around schools and shops and work from there. But AT gives us piecemeal scraps of a network and only where it can be done without inconveniencing the mighty car. The problem is people wont give up parking spaces just on principle. I’d like to see far less parking on prime lane like beach fronts, volcanoes as well as important arterial and secondary arterial roads. 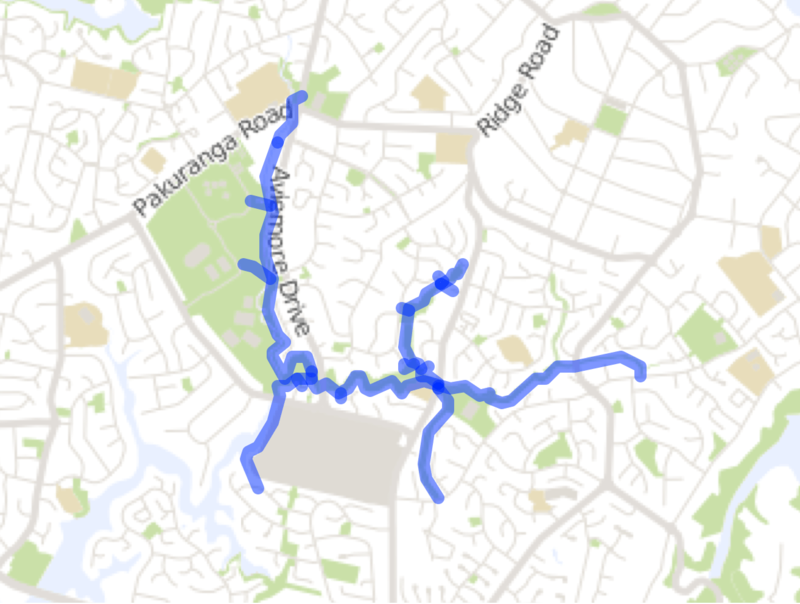 I cycle around Sandringham, Kingsland, Western Springs, Morningside, Mt Eden, Mt Albert a lot (and through to Newmarket/Parnell) and the worst bit is when I want to get from St Lukes to Balmoral (Dominion Rd) or Mt Eden (Mt Eden Road) and have to ride St Lukes/Balmoral Rd. I’m a confident cyclist but don’t feel comfortable here and have felt edges to the kerb more than few times. I ride around there too, and Balmoral Rd and St Lukes Rd are no fun at all. St Lukes Rd is an oversized asphalt-fest, and they’re both crying out for some pedestrian amenity and cycle infra. I avoid them when I can, but it’s not always possible. Plus St Lukes is the nearest access point to the NW Cycleway for a lot of people, so it should be an access point, not an obstacle. Sandringham Rd is mostly OK to cycle on (speaking as a confident cyclist), but not terribly inviting for the less confident rider. The Dominion Rd parallel cycle routes are barely usable. I’m all for neighbourhood traffic calming, but the million stop signs and the ridiculous King Edward St/Burnley Tce detour have sent me back on to Dominion Rd. And we need something to bridge the gap between Onslow Rd and Ian McKinnon Drive. Mixing in with delivery vans and parked cars outside the supermarket is a serious obstacle for the less confident rider. I know it’s not the same thing, but the real secret cycleways around my part of town are the paths through parks and rights-of-way that can be safely used by sensible cyclists. It was game-changer for me when Tim at Rode got out his laptop and showed me an open map of all those alleys and pathways. It’s kind of a shame there don’t seem to be any official maps that make these places evident to would-be cyclists. Protip: many of them will already be in OpenStreetMap, and (being open and free) if you find any that are missing it’s very easy to add them yourself for everyone’s benefit. IMO it isn’t realistic to rely on official sources for a ‘ground-truth’ view of cycling routes. They’re not resourced to provide it, nor are their outputs aligned to real users. The crowd sourced data tends to be far more current, useful and usable. Those who are wedded to GoogleMaps can also get this info there too, and again anyone can suggest additions to their network via MapMaker – see http://cyclingchristchurch.co.nz/2012/09/28/googling-your-way-around-town-by-bike/. We’ve got most of Chch fairly well mapped these days (although still finding little missing shortcuts). Auckland seems to depend on where you are, e.g. south/east Auckland fairly well covered, but little showing on the isthmus. Awesome thanks, it’s been bugging me for ages that the section of Great North Road between Victor Street and Blockhouse Bay road was labelled as a cycle friendly road (!!!!) on Google Maps and so it is great to know of a way to edit that. There are plenty of other mistakes around my neighbourhood too. Question though: how many other people need to review and approve the edit before it will go live? Do we need to get a cabal of Google users to accept each other’s edits to push through corrections? Not sure exactly of the full process (no doubt it explains it somewhere), but it can require just one “Google Reviewer” to OK it. Can be relatively quick depending on workload I guess (e.g. one I proposed yesterday has already been changed). I *think* your credibility as a mapper goes up as you submit more (suitably accurate) changes, and also review other people’s ones. Anything is possible if we use our resources wisely. There is so much potential and so many proven successful examples. With our car only focus last 60 years, I think there is so much demand for the other modes that we just don’t know it yet because those gates were closed to the public. Put in some decent infrastructure and variables change, give people choice don’t just herd us into car lanes and tell us we need to widen so you can get a better level of service. Newsflash Electric Trains eat 10 lane motorways for breakfast and 41% cycle mode share pretty good to for 4m both ways including protection. Walking great too. Great article. I found the NZHerald article about the secret cycleways kind of funny, as it’s reinforcing this notion that Auckland’s really great for all these recreational rides (which it is), and hence cycling budget money gets put into building these lovely paths which go through parks or round waterfronts but don’t actually take you anywhere! As evidenced by the fact the author had to drive to some of them. What a joke. Anyone who looks at effective overseas models of city cycle lanes can see that people are able to use their bikes all over the city, past shops, businesses, transport links, which means you can choose to ride a bike as your form of transport any day, not just for going for a nice waterfront ride round Westhaven on a Sunday afternoon and then jumping back in the car. I commute most days by bike along the ridge lines and down Queen St, and I have to steel myself and grit my teeth just to get through the aggression that is shown to me on the roads by drivers. I love riding my bike and I’ll continue to do so, but with the lack of infrastructure in central Auckland, it makes it a really unpleasant scary ride most days. And yet it would be SO EASY to put in some trial cycle lanes down K, Symonds, Queen – it’s not rocket science and other cities have managed it on main roads, so Auckland should stop pretending it’s so difficult. Just look at NYC. https://www.ted.com/talks/janette_sadik_khan_new_york_s_streets_not_so_mean_any_more I don’t understand why Auckland’s transport decision makers aren’t leaping all over the chance to install central lanes. Not that we don’t need great lanes everywhere in Auckland. But shouldn’t we start centrally and move outwards? See how it goes? The Waikaraka Park cycleway would be much more useful for cyclists heading east or south if there was a bridge over the main railway line which provided direct access to Gt South Rd in the vicinity of the Sylvia Park Rd/Gt South Rd intersection. As it is you are forced to travel north up to Church St before you can cross the railway line. At least when Southdown Station was open you could cut across the foot bridge and get to Gt South Rd via Southdown Lane but the station and the overbridge are both long gone. These are not so much gaps in the exising cycle network, as gaps in the street network for people on bikes. It may sound like a subtle difference, but it captures the key point that we could even forget about the off-road cycleways shown and the argument for bike-enabling streets would stand on its own. A flippant analysis goes like this: imagine three network maps of the same area, say Mangere. In the first, we have the existing cycleway as shown. In the second, we have the idealised, “connected” cycleway, including the town centre and schools and all. In the third, the original cycleway is absent, only the “connections” remain. Of these options, the ideal, second network is the most useful, but the final streets-only grid is a close second, and the original, off-road route alone a distant last. Why is this? First, let’s define streets as the spaces between the front doors of buildings. Then it’s clear that streets play multiple roles: as trip origins on the network (people invariably begin at buildings), as trip destinations on networks (people invariably stop at buildings), and as the network itself. In other words, people invariably want to travel near buildings. This is because it provides options for trip chaining, future trips, social connection, safety, and more. As a rule of thumb, the greater the exposure to frontage along routes in a cycle network, the better (representing usefulness). Likewise, for the density of intersections (representing efficiency). These two factors together can make cycling within an area popular. I’m not discounting all off-road paths forever, of course. The street grid itself has many gaps, especially as a result of designing for automobiles in newer suburbs. Short segments of off-road connections can help heal the grid, as can overbridges and underpasses across severance. Importantly, however, filling-in-the-gaps like this is subject to an overall strategy of sorting out the street grid for non-motorised modes everywhere, rather than stretching more tendrils out from the dendritic spines that our existing off-road paths offer. Sorting out the street grid needs to happen at a neighbourhood scale, which corresponds more or less to a 3-6km travel distance which is most comfortable for everyday, short, local trips. A mode-agnostic origin-destination survey within such a catchment is useful in discovering both existing and latent demand for bike-enabled streets and alignments and approaches to key assets (schools, PT nodes, town centres). But that cannot identify demand across severance, or many future trip patterns, so healing the grid should be a programme not subject to pre-existing demand. Bike-enabling a street is not only about separated tracks, but a wider array of treatments, including humbler fixes like making right-turns easier with refuges, removing turn lanes or slip lanes, traffic calming with bike bypasses, etc., on quieter streets, plus bike parking, gentle kerbs, and various detailed street design elements. On a larger scale, it may rarely involve conversion of a stroad to a boulevard, or creating a shared space, etc. The intent is not just to slap an standard, engineered bike treatmet and get the Austroads tick; rather, it’s to redesign a street for a positive user experience — from front door to front door — accounting for the urban context. 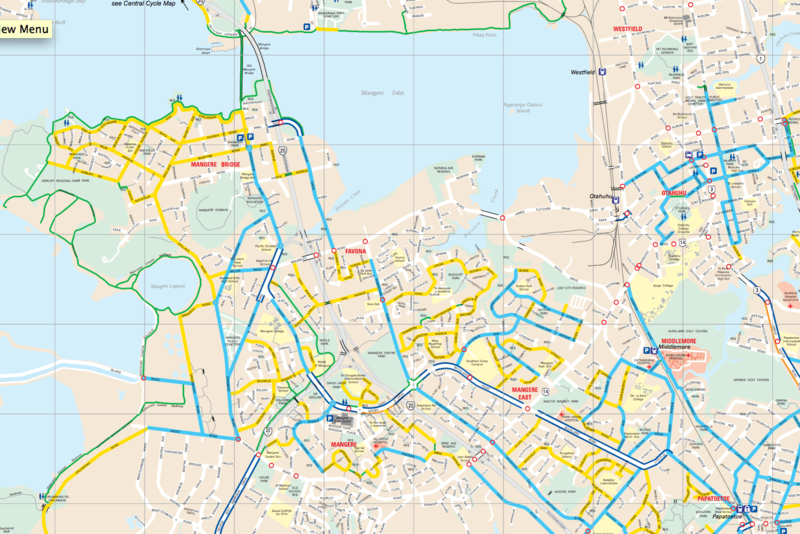 This is the inverse of the Auckland Cycling Network, which seems to be planned on two levels. Firstly, to create routes in parallel to motorised travel. Secondly, to avoid getting in the way of motorised travel. Dominion Rd, for example, is designated as a linear corridor running the full length. This is selected because that’s often how vehicular travel occurs on Dominion Rd (particularly peak commutes) — including vehicular cycling, which is not a popular thing. However, Dominion Rd itself is not (and probably cannot be) treated for cycling along the whole corridor. Instead, AT has created a pair of parallel routes that mirror Dominion Rd, but are situated neatly out of the way of traffic (down to the last detail: on footpaths and not the road). A streets-oriented approach to Dominion Rd would look very different. Accounting for urban context, we’d find that Dominion Rd is not just a corridor, but a string of independent centres, offering local amenities as well as PT nodes that span catchments on either side. These are mainly streetcar suburbs which already have a neat grid, so the best way to leverage that is to focus mini-networks on each local centre: saturated every ~1-3km catchment with bike-enabled streets that invite people to ride from their front doors to the local shops, to bus stops, and to schools. Dominion Rd itself may need a few segments of bike tracks, mainly to link an offset side street to the the centre, or to create an east-west link between offset side streets, but it will not desperately need a full cycling corridor — especially not through the narrowest bits. (Some creative planning can fill in more gaps on Dominion Rd with boulevard-like access streets, or laneway and alleys immediately behind commercial strips.) This is unlike the “parallel route” layout which punches a linear corridor through the catchments without reticulation. And it would still play nice with full-time bus lanes and/or LRT on Dominion Rd (whereas on other corridors, we might seek to eventually upgrade to a full cycleway in due time). That’s the cycle infrastructure missing in every neighbourhood. If we had separated bike lanes on symonds street and queen street, the grafton gully cycleway would be completely superfluous for accessing downtown and people would have places to actually GO in the downtown area by bike. Ha! what is not missing? I think of my daily short commute to work through Grey Lynn, along posonby road, Hopetoun and across to the university. There are a couple of decent bits of cycle lane (Vincent st, wellesley st) and some advanced stop boxes (why aren;t these everywhere?!) but stuff all else to help on some very busy roads (eg mayoral drive, ponsonby road). It is actually embarrassing being a civil engineer. The public has so many grounds for negligence and lack of ethics against the entire industry in particular NZTA. North Shore Busway, Copenhagen mode share, capacity and environmental benefits of electric rail versus highways. The sad thing is I could keep on going as a lot of our arterials are fully multi modal capable right now and if not parallel routes close by. It just involves reprioritising current asphalt width in the majority. 4m width for two way cycling incl 1m physical protection. Could be done so fast you wouldn’t believe it. 2 car lanes 6.5m, 2 bus lanes 6.5m and 4m cycle = 17m. Even if bus had to split out to parallel route is 10.5m width. So many options really. Car parking each side takes up 5m width, flush medians usually 2.5 to 3m width. It just involves someone saying do it as AT fully governs road reserve. Obviously a no nonsense approach to parking and median space helps. But roadmarking is cheap. Wow. As I suspected, it really is that easy. What is taking them so long? Any insight? Is it businesses opposed to losing carparks? Connection between Mahia Road Manurewa and Takanini under the Takanini Mway interchange. I live in Mangere Bridge, and used to cycle to/from work when I was working in Highbrook. Mangere Bridge is well suited to cycling because of it’s grid pattern meaning there a lot of quiet streets to use. Favona Rd is totally cycle unfriendly. I didn’t feel safe riding along there. A couple of parts closer to Otahuhu only have footpaths on one side of the road to escape to. I used to prefer to use the Waikaraka cycleway on the north side of the inlet instead, because it was more pleasant but a fair bit longer. Otahuhu also has some quiet side streets because of it’s grid layout. The layout of many of Mangere Central’s streets on the other hand funnels cars, buses and cyclists on to certain main roads because there are many dead-end streets. 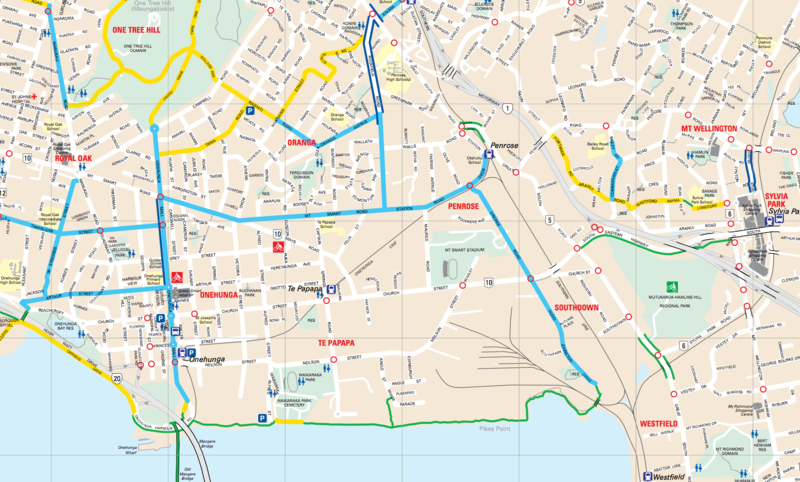 I live in Epsom and ride into the city via The Drive, Balmoral Road, Mount Eden Road, Symonds Street, the magnificent Grafton Gully cycleway and the frustrating beach road and waterfront paths. The missing links for me are The Drive and Mt Eden road and the shared path passed the ferry terminal. The Drive is increasingly being used as a rat run for port traffic. Despite being only sporadically used, parking on either side of the road makes it simply too narrow for trucks and bikes to co-exist. I would love to see parking on one side of the road reprioritised for active modes especially given the number of schools on and around the drive. Moreover if AT was being really ambitious, they could connect this on to the Southwestern shared path in the south and Mt Eden road in the north. Although first they would need to do some work on Mt Eden Road, which combined with upper Symonds street makes has some good riding in bus lanes. However this is only good for people who can keep ahead of the buses, and regardless, the bus lanes aren’t continuous and either side of Mt Eden village only operate for 1 hour per day! Grafton Gully is an absolute marvel compared to riding down Symonds Street. It would be great to have access from Symonds street rather than having to do a dog leg to Upper Queen, but the Nelson street link will fix this for me. Beach road is a start but could be better with the light cycles optimised, perhaps a barnes dance by the old railway station rather than separate pedestrian and cycle phases? The waterfront towards the ferry terminal is great but would be excellent if a cycle path / shared space went all the way to Wynyard rather than disappearing into a footpath to make space for tourist buses. 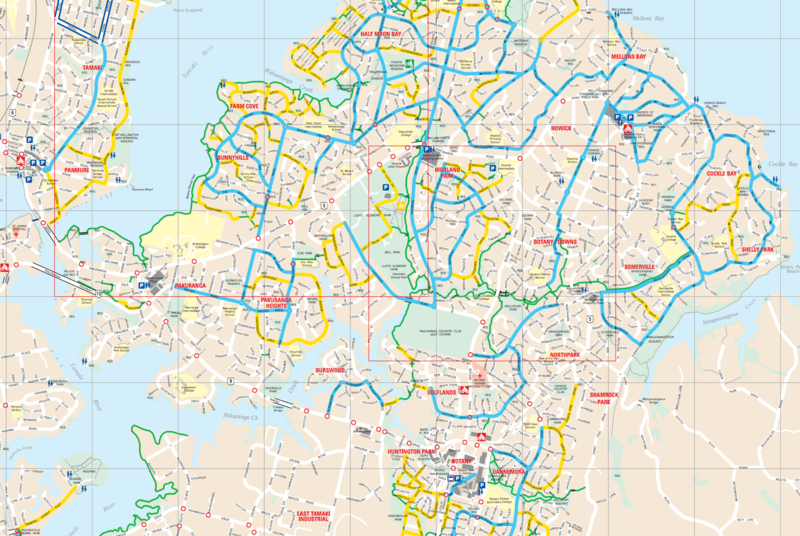 I have used the Howick-Pakuranga network of blue roads a lot. When you look at longer distance PT assistance to travel the nearest railway station is at Panmure. There is no connection. Making a quick connection by converting motor vehicle lanes into cycle-lanes gives a single choice of closing one of the three Panmure bridge road lanes . This will fly with both the traffic engineers and the car driving public of the eastern suburbs like a lead balloon. This definitely a case where a cycle dedicated bridging solution needs to be built – like Skypath. It will cost a reasonable amount of dollars. One solution that has been considered in the past is a clip-on to the Panmure bridge. My favorite solution is a dedicated light-rail, pedestrian and cycle bridge from Queens Road to Kerswill Place. Such a bridge would allow light rail from Panmure to continue to Pakuranga Shopping Mall as an elevated line, avoiding the cars queuing for the Panmure Bridge. There is practically nothing in New Lynn – Avondale – Rosebank, a couple of off road paths here and there and a few cycle friendly streets but there are lots of dead ends and cul de sacs. I do a lot of pavement jumping to get around. The Whau local board are walking and cycling friendly but completely hamstrung by the lack of funding so I don’t expect to see much happen in the next three years, and just hold out hope that there will be actually be some changes in my lifetime. Supposedly there is a proposed path planned along the railway and in December the local board announced a new bridge in New Lynn that would be part of that. At the same time they announced they had chosen 5 tiny pieces of their overall Greenways plan to take to the next stage (concept designs and community engagement). I guess that might take another three years to be completed and might fill in .. oh …1% of what is needed. On my daily commute, the main problem for me is Great North Road. I go along Victor so I have 7 blocks to negoiate before I get to the shared path opposite Fir Street. 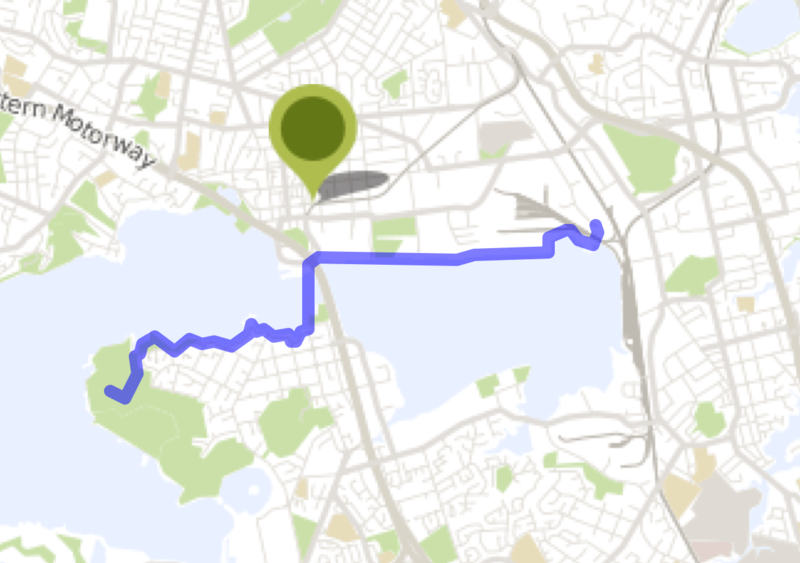 The new Waterview path won’t help as it will be too much of a detour. One of the projects the local board is taking forward is a board walk connecting Holly Street and Heron Park which although it would cut 500 m off my route would probably be unsuitable as it will be narrow and really only for walkers and pretty steep. I’d like to see all the grid of streets with cycle lanes, some compulsary purchases to link up the dead ends and cul de sacs and for any future housing developments to be forced to provide those links. Yeah right. I’ve just moved to Avondale/Rosebank and am trying to figure out the best way to get to the Northwestern Cycleway. It seems that Ash Street/Great North Road is the only real option (other than a 3km detour up Rosebank Rd) but riding in the traffic lanes looks terrifying. Some cycle lanes connecting nearby suburbs to the cycleway are desperately needed! Why is seperated cycling so neglected on all the arterial roads when there is proven potential to be top of the list? So many benefits, health, environment, kids independence, no emissions, long term solution, electric assist or electric scooters for elderly we have an aging population, removing car dependence, cheap transport even for $500 can get something good. Sustainability, environmental, community well being can keep on going. Copenhagen showing possibilities we could probably do better. What is wrong here, anyway happy to assist anywhere believe case watertight against entire industry if they are not going to do it we will have to make them. Tomorrow will be interesting , I’m not directly working in the transport industry last 12 months so happy to front against whatever based on engineering ethics. A further fail in the Botany area is that the major employment area of Highbrook is a cycling no go area. Despite Springs/Harris road having potential for separated cycle lanes, currently it is catastrophic. I am pleased though that a new path is being constructed around Golflands, but crossing Ti Rakau as a cyclist is lethal. Special mention for the bike lane running from the Nor-western cycleway towards the the village shops in Te Atatu (alongside Harbour View Park). If you’re coming from the motorway it suddenly ends just before the shops leaving you stuck on on the wrong side of the road needing to cross two lanes of traffic. Motorists will often yell at people riding on road demanding to know why they aren’t on the bike path.